In the Conversation Course we will teach the linguistic resources needed for speaking fluently in Spanish. 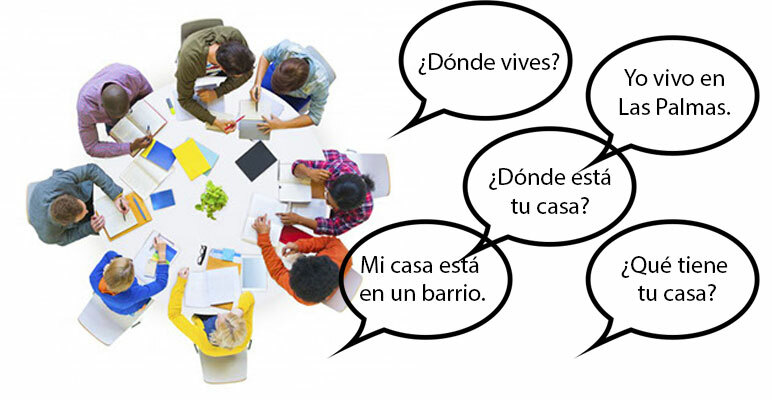 The Spanish Conversation Course includes four weekly lessons four days a week and will be taught in Spanish. We will create activities and situations designed to improve the speaking skills of the students. In order to enrol in our Conversation Course we require at least an intermediate Spanish level, as in the Conversation Course we will focus on improving the oral production rather than other areas of the language. If you live in Gran Canaria for more than 2 months, you could get a discount of 15% on your Conversation Spanish Course. This offer is valid on bookings of minimum 1 month. Follow this link to enroll in the course. You can also sign-up for the Trial Spanish lesson. * The minimum number of students per class is four. If there are less than four students in the class, the course will have less teaching hours. If you want to check our conditions in detail, check the General Terms and Conditions section.